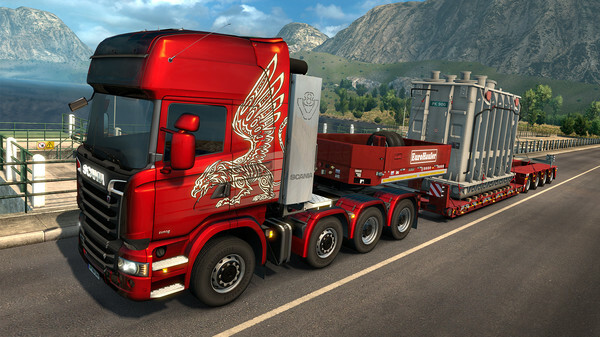 The popular Euro Truck Simulator 2 has launched a “heavy” load of downloadable content. SCS Software’s European truck driving game is upping the ante for players wishing to brave European roads, allowing for the hauling of up to 61 tons with its new Heavy Cargo DLC. New heavy loads that can be hauled range from metal centering at 28 tons to a Bosloc locomotive at 61 tons. To assist with hauling these new loads, drivers will have the option to use new, high-tech trailers with steering axles. Alongside the new DLC, the base game has launched new, free content. This includes some new chassis, including the Mercedes-Benz’s Actros. Also available are new accessories to deck out your rig and a new Truck Analysis screen which can give players insight into the suitability of a truck configuration to your transportation task at hand. SCS Software has a history of creating games to place players behind big rigs. The Prague-based developer started with Hunting Unlimited as their first title in 2001, and the following year they released Hard Truck: 18 Wheels of Steel. After their first two titles, SCS Software has launched more than two dozen driving sinulators, allowing players to drive trucks and buses all across America and Europe. They even took to the sea with 2005’s OceanDive. The first Euro Truck Simulator launched in 2010 and sold around 640,000 copies, according to the Steamspy figures. The second game in the series hit the market in 2012 and has been immensely more popular. Euro Truck Simulator 2 has sold nearly 4 million copies on Steam, according to Steamspy. The Czech company’s newest video game is American Truck Simulator, launched just last year. Around 630,000 people own the title. While Euro Truck Simulator 2 s not the developer’s newest intellectual property, they are still working to expand it as one of their most promising. The Heavy Cargo DLC is available on Steam for CDN $5.49. Next articleGiveaway – The Deadly Tower of Monsters!